Deck the halls with Hallelujahs — ’tis the season for the king of oratorio kings, Handel’s Messiah, to return for its annual tour of duty. 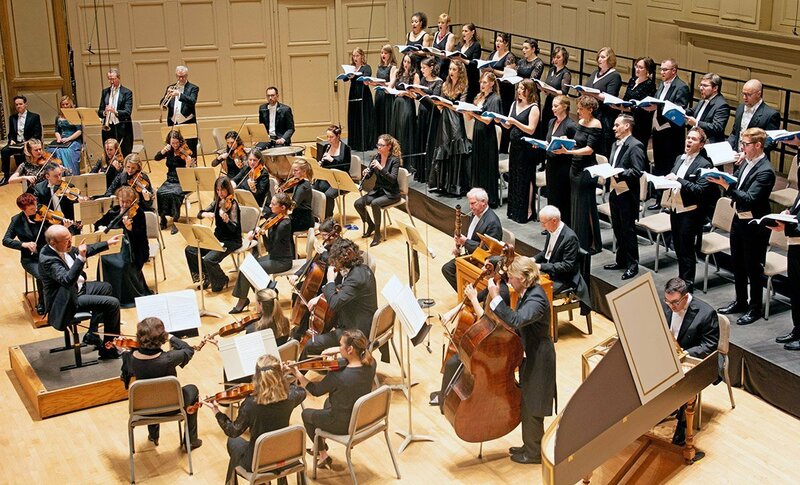 Friday night in a fully packed Symphony Hall, the venerable Handel and Haydn Society kicked off the holiday season with its offering of this perennially popular Boston tradition now 165-consecutive-years strong. Founding director of the Canadian period ensemble Les Violons du Roy and newly installed principal conductor of Orchestra of St. Luke’s, Bernard Labadie led a refreshingly dry — as in good wine, not bad cake — and disciplined rendition of what otherwise often risks devolving into the aural equivalent of a frothy pumpkin-spice beverage. Almost percussive in precision, with accentuated articulation between notes, the orchestra exercised a lean muscularity, mesmerizing to behold. More than merely illuminate a familiar masterpiece, the musicians’ x-ray vision revealed the structural rigor underlying all those catchy tunes, enough to appease any partisan curmudgeon prone to pooh-pooh Handel in favor of Bach. Soprano Lucy Crowe, nimble and bright, sparkled with a tinselly crinkle that may appeal more to some than others. Masterful in molding her lines, she especially shone as she leaned into dynamic curves. Often just before cresting a crescendo, her voice radiated a golden warmth that I missed elsewhere. Countertenor Iestyn Davies was unfortunately battling a chest infection to which he succumbed after opening night. (Mezzo-soprano Christine Rice replaced him on Saturday and Sunday.) When a member of the administration discreetly informed me of this at intermission, I could honestly claim that I had not noticed anything awry. Other than a single uncharacteristically pronounced breath in the middle of an extended run, Davies effectively projected his usual dove-toned grace through Part the First and an elegantly elegiac “He was despised and rejected of men.” Signs of fatigue began to manifest thereafter, but he heroically soldiered through. Meanwhile, tenor James Gilchrist, who has performed laudably elsewhere on the cantata circuit, did not, to my knowledge, have a doctor’s note to excuse him of a strained top, faded bottom, jellied vibrato, or lagging behind the beat on numerous occasions. Bass-baritone Philippe Sly possesses a magnificent instrument, all the more remarkable when he charges through 16th notes like a Tommy Gun shooting cannon balls. Even — or especially — when stretching its upper range, he should trust in his voice’s inherent magnetism to sustain beyond stentorian strength. Thirty-strong, the H+H chorus sang with a clear tone and even blend, lithe and dynamic in the extended fugal runs, judicious in its lyrical indulgences. The famous “Hallelujah” chorus predictably rallied a standing ovation, but the prancing-lamb gait of “All we, like sheep” that descends into the dissonant stillness of “and the Lord hath laid on Him the iniquity of us all” drew stifled gasps, and the nearly a cappella passages of “Since by man came death” and the Amen impressed all the more in their unadorned exactitude. Symphony Hall’s acoustic understandably favors orchestral forces above any vocalists short of Wagnerian volume. H+H orchestra’s one-breath, one-soul strings certainly shone bright enough to eclipse all else, even though they played with noble, supportive restraint, as did the trumpets and sensitively supple basso continuo. One could miss the lush exuberance that customarily elevates and amplifies Messiah’s vocal parts in a church setting, but here, as on a beach at low tide, I reveled in the richness of detail that had eluded me before, and marveled at the delicate dance of balance between chorus and orchestra. From where I sat near the center of the hall on the floor, two more basses and perhaps one additional tenor in the chorus might have weighted the scales a bit closer to perfection, and more’s the pity that the delicacy of the three wind players remained mostly buried behind the 18 strings. These minor wishful quibbles aside, I applaud a resoundingly successful Messiah that H+H has rais’d incorruptible once again. Long may it reign. What a great review. More please….